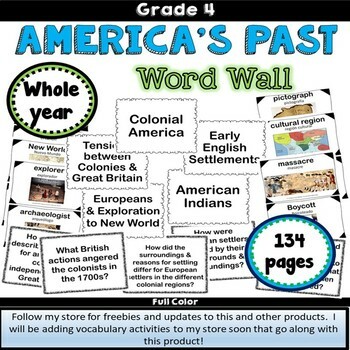 This product is a 137 pages and includes ALL the vocabulary words for the Social Studies Alive: America's Past curriculum. All words are illustrated in full color and can be printed in black & white. Each page also contains chapter and title at bottom for easy reference/storage. Follow my store for freebies and updates to this product. Coming soon - more vocabulary activities that can be used with this product.